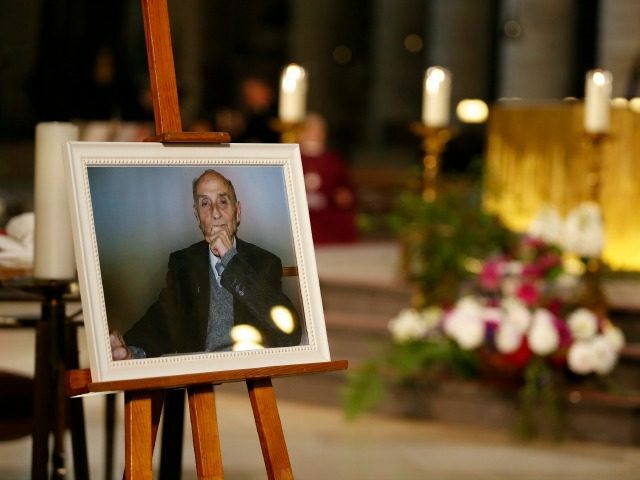 The life of Father Jacques Hamel, slain in his church by two jihadists of the Islamic State, continues to speak and to inspire, said Archbishop Dominique Lebrun Wednesday in a Mass commemorating the first anniversary of the priest’s death. The Mass, attended by dignitaries including French President Emmanuel Macron, was celebrated in the parish church of Saint-Etienne-du-Rouvray, the very spot where Father Hamel was killed last July 26. On that day, two 19-year-old Muslim terrorists who had pledged allegiance to the Islamic State stormed the church where Father Hamel was saying Mass, and slit the priest’s throat. In his homily at Mass, Dominique Lebrun, the Archbishop of Rouen (Normandy), cited the words of Jesus, applying them to the martyred priest: “If the grain of wheat does not fall to the ground and die, it remains single grain; But if it dies it bears much fruit” (Jn 12:24). Archbishop Lebrun said that the priest left an eloquent testimony that continues to speak today. For his part, the French President took advantage of the occasion to hold up the principle of religious liberty, asserting that the Republic “does not fight religion. It works every day so that everyone can believe or not, as a free man,” Macron said after the ceremony. “I thank you for having given the same example to all of France for having refused this thirst for vengeance and retaliation,” he said. “These two murderers wanted to exacerbate the fear of the French, and thanks to you, again, they failed,” he said.